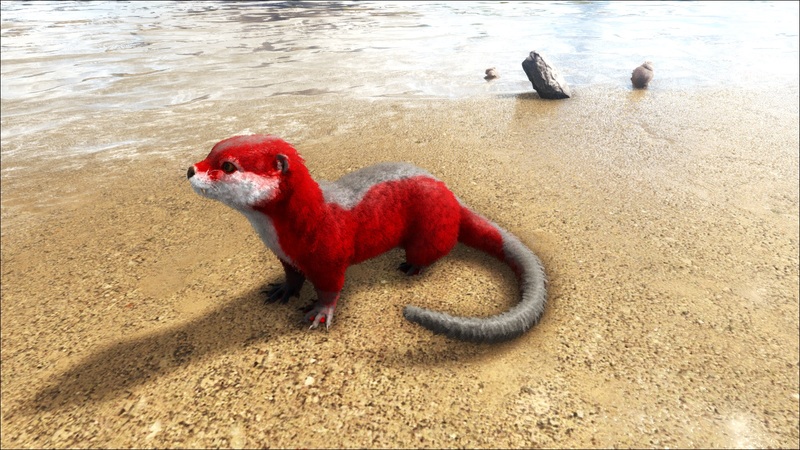 The Otter is one of the Creatures in ARK: Survival Evolved. Found along the Island’s many inland waterways, Lutra Peloso have become exceptionally adept at hunting and foraging. This species of Otter has to be particularly cunning because of its diminutive size, and fierce competition for its preferred food source: fish. It is not a creature that excels at combat, and would not naturally pose an intimidating threat to any predators. Finding packs of river Otters is simple enough: They are distinguished by their elongated bodies, bushy tails, and webbed feet. Their trusting and inquisitive nature ensures they are often hunted for their lustrous fur, but many prefer to tame them to become trusted companions. There are few creatures which provide the companionship that Lutra Peloso does. Rather than traveling beside you, it would prefer to comfortably rest on your back, providing insulation. Once domesticated, it can be told to harvest fish on demand, with a specific goal in mind from the fish that it consumes, the otter has a knack for foraging silica pearls, and can even yield a slight chance at finding black pearls within! Otters spend most of their life in the water, darting rapidly around without wandering too far from their origin. They target fish, from which they can harvest raw fish, silica pearls and black pearls. They can harvest meat from dead corpses too but, after taming, they only eat fish. The otter is a very small animal, easily overlooked, and clearly resembling the modern otter. Their short, lustrous fur is brown, and when on land they move with a distinctive loping gait. This section displays the Otter's natural colors and regions. For demonstration, the regions below are colored red over an albino Otter. The colored squares shown underneath each region's description are the colors that the Otter will randomly spawn with to provide an overall range of its natural color scheme. Hover your cursor over a color to display its name and ID. For example, "cheat SetTargetDinoColor 0 6" would color the Otter's "body main" magenta. The Otter is a friendly creature and will attempt to flee when attacked, so be ready for a small chase. Because of its low health, even a Spear can make quick work of an Otter. 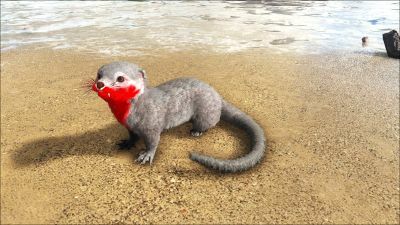 The Otter poses essentially no dangers to even a low-level survivor, but its decent speed in water can quickly lead a survivor into a more dangerous area. Very low HP, can be easily killed by Piranhas or swarms of Salmon. The Otter is passively tamed in a manner similar to the Hesperornis. Fish must be killed, and their corpses dragged to the Otter. While still holding the fish, press e, , to feed the fish to the Otter. Larger fish, and fish killed by the Ichthyornis, provide a higher taming percentage per fish. Whilst they can be tamed by a solo survivor, having a buddy along to follow the otter whilst the other gathers the fish will ease the task of re-locating the tiny, fast animal for feeding. In ARK: Survival Evolved Mobile, the Otter is passively tamed using Raw Fish Meat. The relative ease of taming an Otter can provide early survivors with a reliable food source as the otter retrieves fish for them to cook, staving off hunger until better food sources can be acquired. Tip: keep them away from piranhas, their low health makes them easy to be killed. Kill fish by yourself and make them gather the corpses. Otter can work in a team with Ichthyornis (Ichthyornis brings fish, otter collects (prime) fish; however the otter seem to not collect pearls in this case. The Otter's ability to collect Silica Pearls and rarely Black Pearls from fish can provide early survivors - and even advanced survivors with no ocean presence - limited access to these resources until survivors have the ability to go diving for large concentrations themselves. However, as they have a limited oxygen supply, leaving them on aggressive, even if following a creature out of water, can cause them to drown if a large fish spawn occurs, or they get trapped behind or under something under water. This severely limits their use as an automatic gatherer of any resource. Like the Dimetrodon, the Otter provides a stacking insulation effect to nearby survivors. Unlike the Dimetrodon, however, the Otter can be carried around on a survivor's shoulder, which allows a passive insulation bonus while out and about. Leveling the Otter's Melee Damage increases the amount of insulation provided; hypothermic insulation is about 75 - 82% of melee damage, and hyperthermic is about 34 - 38% when the Otter is being carried. Ever since the Otter was introduced to the game at the official launch of ARK, it has been able to store as many of the same Artifact as its weight allows, despite the fact that no other creature, including players, in ARK can hold more than one of the same type of Artifact. It is unknown if this is a glitch that has still somehow not been fixed, or intended. Because of their all around cuteness, Otters are a popular pet among survivors, even with the ability to put a hat on them. The Otter was first revealed on August 5, 2017. Although the Dossier states they are omnivores, they are in fact piscivores and only eat fish meat. Otters will not receive a pack bonus when staying nearby other wild or tamed otters. The in-game scientific name translates as Hairy Otter, there is no such real-world classification. This may be a reference to the character and series, Harry Potter. 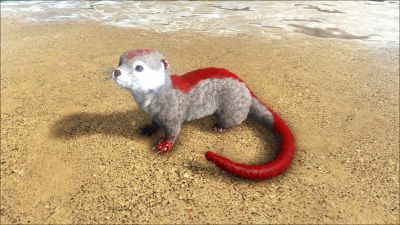 In ARK: Survival Evolved Mobile, the Otter cannot transport any Artifacts.